The 200th birthday of the founder of evolutionary biology, Charles Darwin, is being celebrated in 2009. 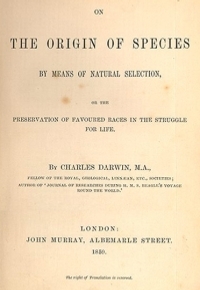 This year also marks the 150th anniversary of the first publication of his work "On the Origin of Species". vifabio takes this opportunity to compile the most important internet resources on the subject, and other information. Darwin’s books and letters, his life, web pages about evolution, information about events and projects – the editors of vifabio present you with their selection of important web sites for the Darwin Year. vifabio has far more than 10+1 internet resources to offer on Darwin and Evolution. Here you will find the complete list, together with hints on further search possibilities. books, journals and essays can be found in the Virtual Catalogue. Instructions for its use, and examples are shown here. This dossier is a part of the activities presented by BioFrankfurt during 2009, the Darwin Year.